The villagers in the region of the Blanca where we are currently distributing school supplies and solar lighting do not have access to even the most basic health care. 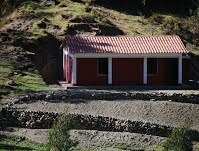 In April, we started on a plan to open a clinic in the village of Quishuar that would serve the 3000 people in the nearby 10 villages and surrounding area. This was a very big first step, but only the beginning. In August, we met the President of one of the villages we visited while distributing school supplies and solar lights, a nurse named Cirila Flores Rondan. LED has now arranged for Cirila to travel by horse to the village of Quishuar one day a week to provide nursing services to villagers in this area. Cirila is qualified in many facets of health care. 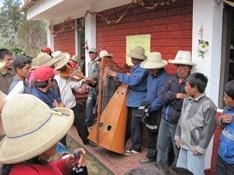 There are plans for her to offer prenatal, sanitation, and hygiene classes in the immediate future. She is attending to at least 10 people each visit. The number is increasing as word reaches the people in the region. Most of April was spent purchasing materials for the clinic. All the bricks and cement were purchased locally. 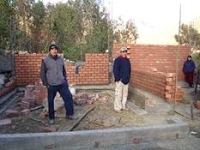 We hired 2 masons from a neighboring village to handle the construction. Much of the labour was done by the villagers on a voluntary basis. An amazing spirit of cooperation prevailed throughout the entire project. The clinic was constructed in 8 weeks. 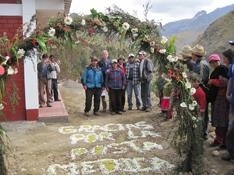 The tremendous efforts of the entire Bedon family, Senor Juan and Val Pitkethly are the reason it was completed quickly. In July, Dr. Rod Leighton and Ray Potvin volunteered their valuable time at the clinic. Dr. Leighton worked with Cirila on advanced medical skills. 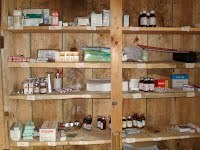 Ray, a pharmacist, created a formulary and helped Cirila organize the pharmaceutical aspect of the clinic. We are very thankful they chose to spend their holiday time volunteering with us. We are deeply grateful to all that worked on the project. The Clinic is now open 5 days a week! We are encouraging the people in the region to have ownership in the solution by paying a small amount for the use of the clinic and any prescription medication. This money is used for replacement medication. We visited the clinic numerous times between April and August this year. 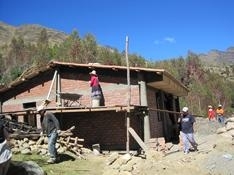 We are constantly making improvements to better serve the villages. Much of our efforts have been in the area of hygiene and sanitation. We are completing the installation of a permanent water source. We have also installed a shower, solar water heater and composting toilet. The improved health of the children is indicative of the work done by our health care workers this past year. Unfortunately Cirila had to leave her post and return to her village. We are pleased to announce the appointment of a new health worker, Kathy, to the position in January 2011.